The Ford Taurus has been one of the most highly-regarded, widely-respected automobiles on the market for about 30 years. A primary reason why the Ford Taurus is well-regarded stems in part from its array of interior features. 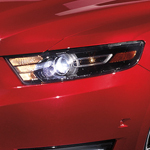 One of the interior features of the Ford Taurus is its ambient lighting system. The ambient lighting system provides a elegant, comfortable feel to the Taurus. The ambient lighting system permits you the ability to select a favored color scheme in a number of hues, including purple, green, or blue. The Ford Taurus also features heated and cooled front seats. The heated and cooled front seats include three settings for the heated and cooled options. If you desire a test drive, or if you want to learn more about the Ford Taurus features, visit Lance Cunningham Ford. Our team of experienced, friendly specialists is located conveniently in Knoxville and stand ready to assist you in learning more about the Taurus.